Filled to the brim with the world's finest chocolates, this one-of-a-kind creation is one of our most popular gifts and a joy to receive. A leather keepsake book replica holds a rich variety of award-winning Godiva chocolate confections, with an optional personalized satin ribbon. Godiva Chocoiste Milk Chocolate with Raspberry. 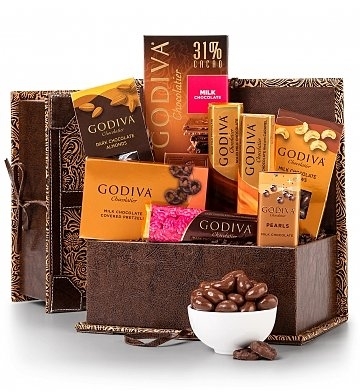 Godiva Chocolatier: The winner of the Luxist Awards' Readers' Choice Award for Best Chocolate and a certified kosher dairy product. Items are packaged by hand in an intricately designed keepsake book replica.